MaryJane's Outpost is the newest book authored by Moscow's own MaryJane Butters. MaryJane, a Co-op member and volunteer for more than two decades, is the organic pioneer who has built an international business that includes websites, a magazine, a syndicated newspaper column, and a wide variety of products available online and through retailers nationwide. 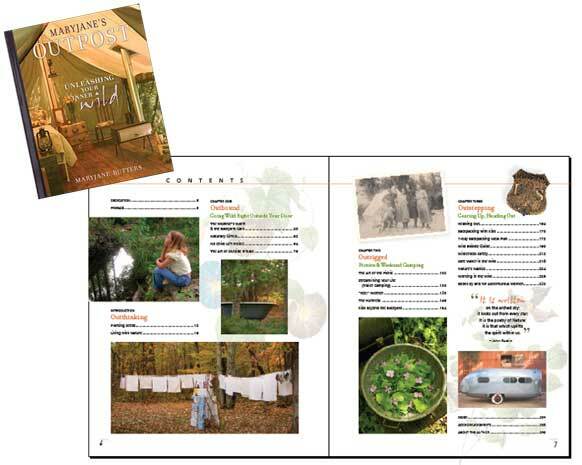 Even though the book came from the huge New York publisher Random House, this is truly a Moscow product—conceived, written, photographed, and designed here in Moscow by the MaryJanesFarm crew. The themes and the writing come from MaryJane's own experiences as a wilderness ranger, backpacker, deer hunter, and freshwater angler. Almost all the photos were taken by MaryJane and her crew on her farm. And the book's designer was MaryJane's talented sidekick Carol Hill (who is also a long-time Co-op member and now one of the volunteer issue editors for our Co-op newsletter). We can all be proud of this Moscow product. The text flows as clearly as the mountain streams MaryJane describes. The photos are postcard-perfect. And the design is inviting and folksy without being tacky and overly cute. The book's subtitle (“unleashing your inner wild”) really summarizes MaryJane's theme and purpose. She's speaking directly to her target audience with those words. She's telling women that they will find fulfillment and empowerment in opening their own lives to the natural world. MaryJane offers clear and specific examples of small steps anyone, even urban or suburban women and their families, can take to bring the outdoors into their lives. Try sleeping out in the back yard. Make outdoorsy crafts like fishing tackle earrings or canning jar lanterns. Rig up an outdoors clawfoot bathtub. Plant a garden or harvest wild foods. Involve your kids with games and crafts. For the truly adventurous, MaryJane moves from the safe territory of crafts and gardens into a supportive feminine voice in favor of deer hunting and fishing. She learned how to do both as a child in Utah, and perfected her skills as a ranger, backpacker, and fire lookout in the Idaho wilderness. In the book, she explains the how and why of both hunting and fishing—and offers the voices and experiences of other women who share that enthusiasm. As in her previous books and in her magazine, MaryJane adds a wide variety of examples, recipes, specific how-to plans, profiles, and bibliographical listings as sidebars in her chapters. The finished mosaic is a book that can be digested carefully page by page or scanned quickly and often, with each visit revealing a new fact or intriguing story. Signed copies of this 240 page hardcover book are now available at the Co-op at a special display near the front of the store.